It's easy to think meatballs are a simple dish but if you've ever seen them being made, or you've tried making them, you'll know there's a lot of effort that goes into their creation. On top of that, then you need to cook the whole thing which goes to show what a long and tedious process it is. Near my hood, a meatball shop, aptly named Meatballism, opened up a few months back which I was curious to try. I had the chance to try it out recently with some friends visiting my hood. Here are my thoughts! 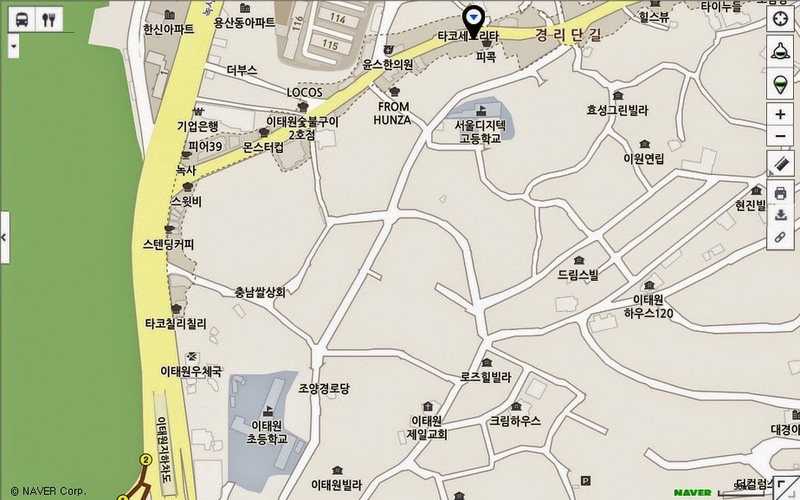 Meatballism is located at around the halfway point between the entrance of Kyunglidan and its end near the Hyatt. It's a small shop with only a few tables, a self-serve bar, and the restaurant's open kitchen. The restaurant displays on its walls its business license and shares where the origins of its main ingredients comes from: beef from Australia, pork from Korea, chicken from Brazil, and rice from Korea. Above the kitchen bar, they highlight a daily special which happened to be a western bacon slider set on my day of visit. Seeing the special's price though, I was rather taken aback as a slider set- even if it was made of steak and bacon- was quite pricey at 16,000 won, especially seeing how it only came with some corn salad (which I have a hunch was canned corn). But the rest of the menu itself seemed more reasonable in price with sides starting as low as 5,000 and the priciest main at 16,000. The mains include meatball spaghetti (16,000 for spaghetti, 2 meatballs, and garlic bread slice), naked meatball (8,000 for 2 meatballs and sauce with garlic bread or 14,000 for 4 meatballs), the meatballism burger (9,000), meatball sandwich (12,000), and meatball slider (4,500). But when you took into account that the main menu dishes came without any sides or drinks, frugal this restaurant certainly was not. Whichever main you choose you have the option of choosing your meatballs which are offered in classic, spicy pork, and chicken. Then you choose the sauce (tomato, spicy pork bolognese, mushroom cream, and pesto) and any sides such as a fried egg, garlic bread, mozzarella cheese, or additional meatballs. When I visited, they had begun charging an extra 2,000 for the pesto sauce because of the shortage in availability of basil during winter they said. They have a number of sides that they offer in additional the meatball mains including spaghetti (with your choice of sauces), bacon mac and cheese, Caesar salad, honey butter chips and more. Sides run between 5 to 10,000 won. A daily dessert special is also offered. A number of craft bottled beers are on the menu for drinks as are draft beers and glasses of house wines. The bottled beers were on the pricier end but house wines were cheap. Soft drinks are 2,500 and also Perrier (3,500), orange juice (4,000), and Martinelli's (4,000). Meatballism is an entirely self-serve place with orders taken at the cashier desk and food picked up on your own. The self-service bar also provides utensils, wet napkins, pickles, jalapenos, Parmesan cheese powder, and hot sauce. Having gone with two friends, we were able to try all three kinds of meatballs and even nabbed the last of the classic meatballs (which was kind of odd as it was an early dinner time on a weeknight that we went). They have a rule that whatever meatball variety you order that you keep it uniform so my friend had the classic meatballs and spaghetti in mushroom cream sauce, another friend had the chicken meatball burger, and I had the spicy pork meatball. As I mentioned, it's an open kitchen so you can see them make your dishes to order. As small as the kitchen and restaurant was, we were surprised at the number of staff; there were at least four (possibly a fifth) kitchen staff that were in the tiny kitchen and we were only one of two parties there. Don't know if the crowded kitchen had anything to do with it but it took quite some time for the food to come out. Visual-wise, each dish would be quite the looker if not for the burger and sandwich seeming a bit bare just sitting on their plates alone. A small side salad, a few fries... something in addition would have been nice (and especially at those prices). I do appreciate that they put an emphasis on the details of the sandwich and burger including Provolone cheese, freshly grated Parmesan, bread baked up with spread and plentiful sauces. The meatball spaghetti, however, was a big miss. The cream and mushroom sauce didn't skimp on the mushroom but the sauce overall was bland and the spaghetti noodles were quite overcooked and going limp. At 16,000 won for the plate, it was enormously overpriced for a dish of soggy noodles, flavorless sauce, and two meatballs. The tomato sauce on the sandwich was far superior. The meatballs themselves are fantastic. The spicy pork and classic being my two favorites. The fresh herbs in the classic meatball really accentuates the flavors of the meat itself and had me reminiscing to some of my favorite Italian restaurants back in the States. The spicy pork has some great earthy and spicy notes to it that reminded me of chorizo. The chicken meatball was fine but didn't compare to its other two brothers though all three had a nice fat-meat ratio that made it perfectly moist. I was joined with two other friends on my visit and the three of us concurred on our way out. Our food was decent and overall quality was high but the restaurant was overpriced for both the food and serving size. In fact, despite each of us ordering an entree, we headed down a few meters immediately after to get some chicken wings and beer which we had no problem demolishing! From exit 2 of Noksapyeong Station, walk straight for about 200 meters until you get to the pedestrian underpass and cross over to the other side. The other side has two exits but you'll want to take the one on the left. From the underpass exit, walk just a bit to the three way intersection (with Noxa Lounge on the other side) and turn right to walk up Kyunglidan. You'll want to walk about 300 meters (passing the Cafe Pascucci, Bongu Beer, etc) until you see Meatballism on your right. Weekly specials are put up by the place and advertised on their chalkboard menu in-store as well as their Facebook page.